When it comes to manufacturing and fabrication, United Global Sourcing strives to find the best for its clients. We offer a list of fully vetted, top-caliber factories for you to leverage to lower costs, increase sales, and improve fulfillment. Our commitment to 24-hour communication, unlike most of the industry, is what sets us apart from our competitors. We understand you’re looking for the best outsourced manufacturing for your automotive parts, sporting goods, or cut and sew products. In this post, we’ll share the five benefits of outsourcing manufacturing. Are you ready to get started? Contact United Global Sourcing today! Otherwise, continue reading this post to to learn about the benefits. If your company produces a product, than you can benefit from outsourcing your manufacturing. It can be tough to determine where and how you complete your manufacturing responsibilities could cost or save you money. Why worry about it? United Global Sourcing does the work for you. 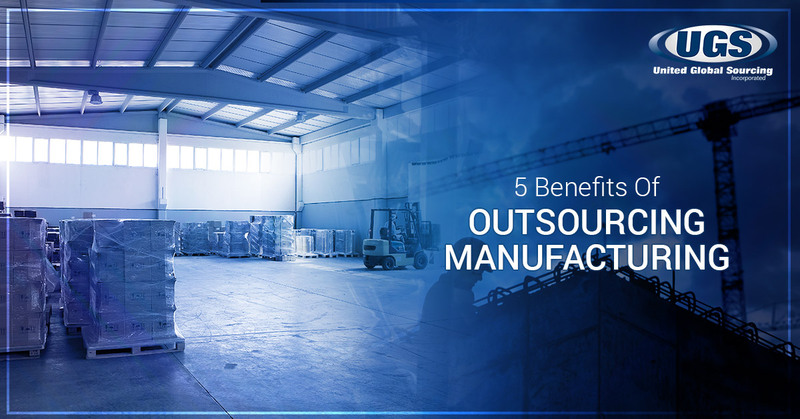 Here are the five benefits to outsourcing your manufacturing. You can save a substantial amount of money when you choose to purchase components from outside suppliers compared to manufacturing them yourself. It’s important to also consider the cost of purchasing from outside suppliers, transportation costs, receiving costs, and quality control expenses. When you determine this set of expenses to be less than fabrication in-house, you can save quite a bit outsourcing. As you grow your business, you will find outsourcing manufacturing allows you to increase or decrease production based on a variety of factors, including changes in demand, pricing, or purchasing. Purchasing from outside suppliers can also allow you to save money on labor costs, especially in the US. This gives you more cash flow, and the ability to take more risks to expand your business at a quicker pace. If you’re seeing an increase in demand, but you cannot supply, you may find outsourcing fabrication and manufacturing to mitigate losses due to understaffing or production capacity. Don’t let the market get away from you. Grow your business and increase your bottom line in the process. Outsource manufacturing and fabrication to keep your company’s focus narrow. Take stock of what your business does the best and then outsource the rest. Not only will you be able to focus on one or two competencies, but you will also find business growth easier when you don’t have to manage manufacturing and fabrication alongside marketing, public relations, fulfillment, and more. It can be tough to find specialized labor to manufacture or fabricate parts and components you need to fulfill your promise to the market. Add in local labor cost, and you will notice your profits margins shrinking. When you outsource manufacturing, you will find top-tier fabrication while keeping costs of purchasing the product low. You can use the excess profits to grow your business faster and meet the demands of the market as they grow. It can be daunting to trust outsourcing, but the upside is greater than the risk tenfold. You’re able to find those with greater capabilities that can add value to your business for less cost. This means your company can focus on its core competencies and still grow with the market. As demands increase, you can rely on those who are great at manufacturing, fabrication, and more to keep up, make a profit, and thrive into the future. Have you been connected with a manufacturer and abandoned to figure out how outsourcing works? At United Global Sourcing, we pride ourselves on our 24-hour client support. Our round-the-clock communication cycles ensure that components and assemblies are produced and delivered as promised. We connect you with manufacturers and stick around to make sure everything works out perfectly. Focusing on communication and quality, we’re the best outsourcing company in the industry. We provide a number of manufacturing processes and supply-chain services, which help companies increase bottom lines and profit margins. From simple to complex, we handle all your outsourced manufacturing needs. Contact us today to get started!